What a privilege! 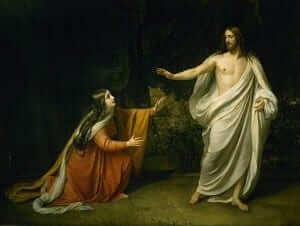 Mary Magdalene was the first person to see the risen Lord, and there is no doubt that many would have concluded that she was the most unworthy person to receive such a blessing. We know the story of Mary Magdalene well. She was a very sinful woman who was almost stoned. Jesus did not condemn her and told those who wanted to stone her that the one without sin should cast the first stone. One by one they left Mary, and Jesus forgave her and reconciled her to the Father. After that, she became a faithful follower of Jesus and radically changed her life. For that reason, we now call her “saint.” But this passage above tells us even more about Jesus and His mercy. This passage is taken from the account of Jesus’ Resurrection. Mary had gone to the tomb only to find it empty. She sat there weeping thinking that someone took Jesus’ body away. But suddenly, before her eyes, Jesus was there and alive. His words were piercing and profound. He said, “Stop holding on to me, for I have not yet ascended to the Father.” There are two things to say about this passage. First, it was indeed a wonderful blessing that Jesus appeared to her first. This sinful woman was now the first witness and first messenger to the Resurrection. This tells us that Jesus does not discriminate against us because of our past sins. He does not have a long memory holding us forever accountable for what we’ve done in the past. His forgiveness is absolute when given and it completely restores us to grace if we are open. This is what happened with Mary. Jesus chose her, this formerly sinful woman, to be His first witness of His Resurrection. Secondly, this passage reveals that Jesus does want us to cling to Him, just not in a purely human way. Mary had come to know Jesus on Earth and now Jesus wanted to deepen His bond with her once He ascended into Heaven. At that time, He wanted to be more than just physically present, He wanted to dwell within her soul and unite Himself to her, and to us, in the most intimate and profound way. Lord, I do want to cling to You. I do choose to be one with You in every way. Come live in my heart and make me one with You. Jesus, I trust in You.